The Battleborn open beta is just under a week away, and accordingly, it's now available for preloading on Steam. 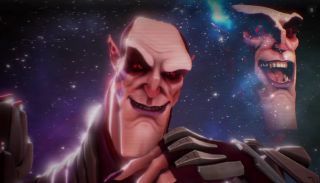 Publisher 2K Games has also revealed a little bit about the Battleborn season pass, and released a new “Bootcamp” trailer that sets up the story of Solus and the Last Light Corporation, and showcases the different gameplay modes and characters. The open beta will include 25 characters, “each with wildly different personalities, powers, and play styles,” available in Story Mode and five-on-five multiplayer matches. It goes live for PC players at 10 am PT on April 13 (PS4 players get it five days earlier) and will run until 7 am PT on April 18.